Before you do anything, go buy the canning/jarring kit at Wal-Mart that’s in a green bag. It’s essential for lifting the jars and the lids out of hot water. First, make your pear juice. If you’re not using your pears for anything, just cut pears up to fill a pot (no need to peel or core them) and fill with water about 1 inch short of the top of the pears. Bring to a boil, then simmer for 30 minutes to an hour, tasting for strength of flavor. If you’re using pears for something else (like pear chips!! or chutney!! more to come soon…) you can still use the peels and the cores to make the juice. Just follow the directions above, keeping in mind you may need to cook a little longer to get that strong pear flavor. You also need to prep your jars at this point. Wash each jar carefully with soap and water, then transfer the jars to a pot of boiling water and the lids to a small pot of warm water. Now that you’ve got your pear juice, stir in the pectin, cinnamon and vanilla and bring it to a full rolling boil- basically, you want the boil to continue to bubble even when you stir it. Add the sugar, and bring it back to a rolling boil. Once it’s boiling, you want it to go for exactly one minute. One by one, take the jars out of the boiling water and fill with the pear jelly. Put a lid on each one and then screw the lid on tightly. A lot of people at this point would tell you you’re done- just put them aside to cool and make sure you hear the lid pop down, sealing the jar. If there’s any give in the top of the lid, it’s not sealed, and you need to eat it soon rather than keeping it. Some people, those who listen to the FDA and the companies that are required to listen to the FDA, recommend that at this point, you’re not done- you need to further “process” the jars to ensure there are no germs. So, they tell you to return the jars to boiling water for 5-10 minutes. I have some pear juice, already canned. (Ripe pears that I couldn’t can. )…Now, I want to make some jelly with that juice…But I have some Frangelico liquer that I want to add. Can I just put a few tablespoons in with the juice? I should I cut down on the juice a bit? 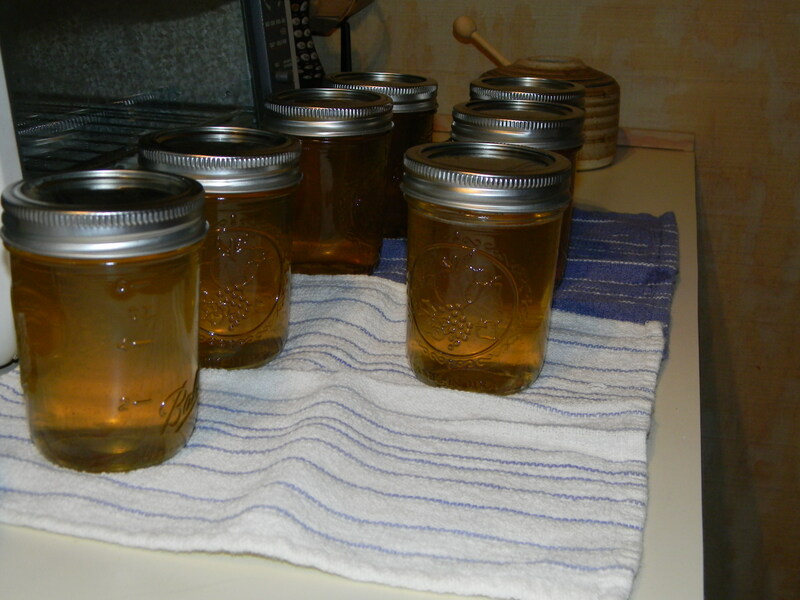 I will use the pectin, as that’s what I do…Had too many failures without it….Let me know what you think!!!! Since there were many comments about this Jelly not setting up I chose to add 1 & 1-2 boxes of Sure gel (or you can just purchase a container of Pectin and measure out three Tablespoons and add the full box and 3 Tbsp of pectin to your recipe, all my jelly set up. So much easier to add the extra pectin up front than having to redo. I also used 4 cups of boiled juice (from skins) and added 2 cups of pear juice to give it a more concentrated taste. You could also do 5 cups boiled down juice and 1 cup Of bottles pear juice to get that hearty flavor. 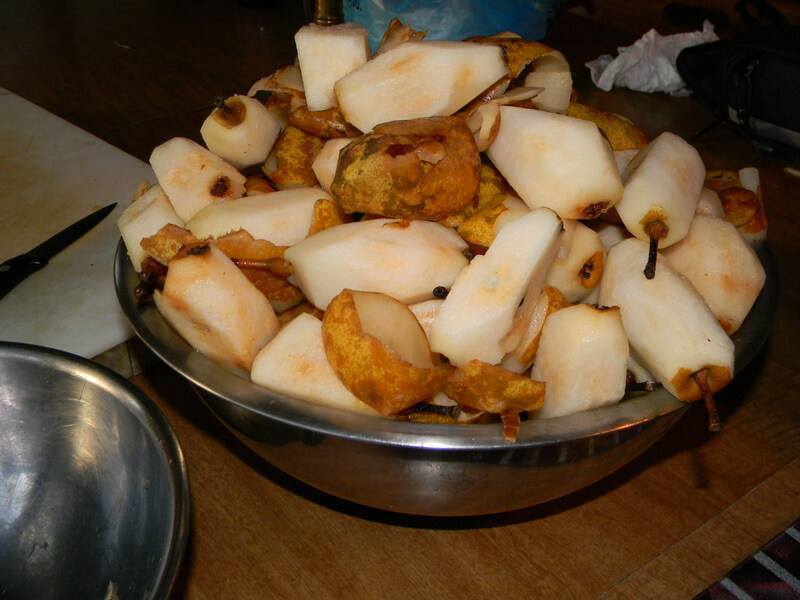 The biggest time savor is this, you can use a very large pot of boiling water and add whole pears unpeeled and boil for 3 of 4 minutes then toss I to some ice Water and the peels just come right off kinda like peeling boiled potatoes saves so much time! To keep your juice from being cloudy, NEVER squeeze the pulp when straining. Just a tip that someone gave me years ago. You can use coffee filters, clean t-shirts, jelly bags or even linen dish towels to strain the pulp with. I have a ridiculously expensive juicer that is collecting dust. Can I just run my pears through THAT to get the juice? Or would that make it bland? As we’ve opened some of our jars over the years, we’ve noticed the same. Some turned out great, and others were a bit too runny. It’s a recipe from our grandmother, who loves the old-fashioned, more runny style of jelly, so a product of the times I guess. Thanks for giving it a try and hope you come back for non-pectin recipes! Is there someplace in here that one is supposed to strain things or something? Jelly is usually clear and this stuff sure ISN’T!